In 2000, the Pintupi people painted pictures of the Ngurra (country), Tjurkurrpa (dreaming) and Walytja (family) to raise funds to establish the Western Desert Nganampa Walytja Palyantjaku Tjutaku Aboriginal Corporation (WDNWPT) and the Purple House. A dialysis clinic offering services to patients with end stage renal disease, the Purple House greatly improves the lives of families forced to leave their country for dialysis in Alice Springs. The life-long dialysis treatment takes these patients many hundreds of kilometers from family, community and traditional country. In addition to the personal dislocation and despair felt by the patient and their family, the removal of community Elders has a significant impact on community and culture. 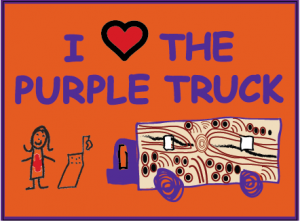 Medicines Australia’s support for a mobile renal dialysis unit—the Purple Truck—has meant people can return to communities and re-engage with Elders, family and traditional country and culture. The Purple Truck visits remote communities according to an itinerary negotiated between WDNWPT staff, WDNWPT committee members and patients. To hear more about how Fresenius Kabi and Medicines Australia help with dialysis in remote areas and the important role that the Purple Truck plays in delivering renal care in the outback, watch this short video interview featuring Margot Hurwitz, Vice President and Managing Director ANZ at Fresenius Medical Care and Scott Sloan, a Partner from their lawyers, DibbsBarker. We note this webcast is copyright. Apart from any use as permitted under the Copyright Act 1968, it may only be reproduced for internal business purposes, and may not otherwise be copied, adapted, amended, published, communicated or otherwise made available to third parties, in whole or in part, in any form or by any means, without the prior written consent of DibbsBarker.